Making neon signs is a dangerous art. Glass tubes heated to 1,400 degrees can shatter, sending razor-sharp shards into the hands of an artist whose concentration has flickered momentarily. Neon artists gamble on skill, eye, focus and a deft touch every time they make a beautiful sign for a restaurant, bar, car wash or other business that craves this form of eye candy. Ortwein Signs has taken that gamble several times a week for more than 90 years. Founded in 1923 by a German immigrant to Chattanooga named Ortwein, it now has locations in Knoxville and Nashville. "We design signs, make them, restore historic signs that are damaged," says Jimmy Teal, who bought Ortwein in 2007. Up to that point, Teal's professional life focused on designing and building technology and machines, so he was looking to buy a business in which he could use those skills. Neon signs are making a comeback in the area thanks to hipsters, he says, those urban millennials who love neon for the artisan talent, old-school handcrafting and unearthly glow, like starlight captured in a bottle. Last week, Ortwein finished a red-and-white neon sign for Puckett's Grocery restaurant near the Tennessee Aquarium. Other Ortwein signs that bloom when dusk falls around Chattanooga: May Brothers Auto on Brainerd Road, Big River Grille at Hamilton Place, Roy's Grille in Rossville, Western Sizzlin' in Ooltewah and the Chattanooga Choo Choo. Small business owners are embracing neon, too. On Friday, Puckett's hung its huge neon sign while Good Fortune Soap owner Jennifer Strain hung her small, lovely neon sign on her Broad Street store where she sells handmade soaps, perfume, balms and lotions. She approached Ortwein but found their prices geared more for larger corporations. Upon further searching, she found South Carolina neon artist David Shields, who created and shipped a neon soap bubble containing "Natural Soap and Spa" glowing in a soft peach hue. "I thought neon would catch the eye of younger customers," Strain says. "When I posted the photo of the sign on Instagram, I wrote 'Old school meets new school,'" Strain says. "Neon fits seamlessly with my store's historic brick building, the black 19th-century lanterns and the scarlet decorative columns. My main concern was that the color not be garish or carnival-like. But this color scheme is exactly right." She and Shields emailed photos back and forth until the design was perfected. Strain felt the main drawback to hiring a lone artist was that it takes longer to produce the sign. For instance, Shields was sick for a month, which caused an unavoidable delay. "But I love neon, and the sign is worth the wait," she says. Jimmy Miller is Ortwein's neon artist, creating beauty in a giant warehouse off Rossville Boulevard. On a typical steamy-hot summer day, his work area is cooled only by big electric fans. The equipment used to create a neon sign has a steampunk-ish air, as if Industrial Age machines adopted high tech. A wooden rack attached to a table holds white-hot glass rods after Miller has carefully bent and twisted them into graceful shapes. He heats the glass tubes over a gas-powered metal strip that fills with flames at the flick of a switch. "Sure, I just hold the glass tube over the flames with my bare hands," Miller says with a shrug. "I use gloves sometimes but not for this." When he bends the glass, he must be careful that no part of the tube is too narrow. He points to a yellow tube contorted into the word "sweet" and notes the bends in the cursive E's. "If that point right there were too narrow, the glass would thin and leak neon gas until the sign burned out into a gray, dead tube with no light," Miller says. Illuminated neon or argon gas are the "paint," the substances that give the signs their colors. Neon glows bright scarlet and argon is deep, glacial blue. The glass tubes themselves are painted various colors so the gas inside will take on even more hues. For example, yellow-painted tubes filled with illuminated argon glow emerald green. At Ortwein, a huge machine with hoses, switches and dials features two glass flasks with long slender necks and bulb-shaped containers. One flask can hold argon gas and the other holds neon. Once Miller finishes shaping a glass tube into a piece of a sign, he takes it and attaches one of the open ends to the mouth of the gas flask. Throwing a switch, neon or argon gas is jetted from the flask into the curvy piece of sign. The other end of the glass tube is then sealed. Ortwein doesn't just make neon signs. It also installs high intensity lights like the ones that spotlight billboards after dark. And in the adjacent workroom to Miller, employees attach circuitry inside a plastic LED sign. "An LED sign's lighting is replaced about every five years but a well-made neon sign out in the windy, rainy, cold and hot weather has a life of 50 years," Miller says proudly. "That's how long it will be luminous." Electric signs made of glass tubes filled with gas that gleamed with colors were made as early as 1888, but the color faded quickly as the gas lost its pressure. Then scientists found that neon had a long-lasting scarlet glow when captured in a tube and illuminated. In 1923, Earle C. Anthony installed America's first neon sign at his Los Angeles car dealership. By the 1960s, industrial research on how different types of phosphor, the substance that coats the inside of a neon sign's glass tubes, could give off a different color when illuminated offeredneon designers a range of 24 colors. Today there are nearly 100 available shades. But by the '70s, neon had lost some of its glow and neon artist Rudi Stern kicked off a nationwide effort to preserve handcrafted antique neon signs. "There was a time when neon was a trade that demanded design expertise and precision through many stages of a handcraft process," Stern wrote in his 1977 book, "Let There Be Neon," a combination of guide and homage that details how to restore vintage neon signs, offers fun anecdotes about signs' histories and lists where to find superb examples of existing neon signs. 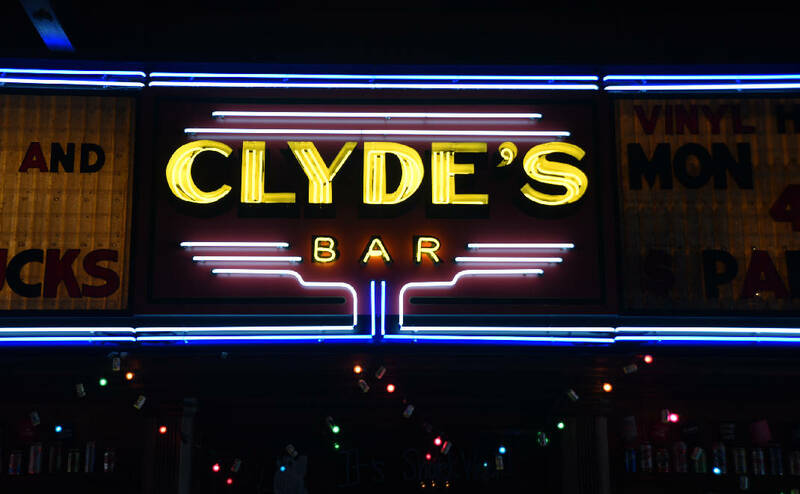 Stern argued that neon signs were as much an amenity for a cityscape as a neo-Gothic building or a pretty pocket park. "As artistic feats of technical virtuosity, these electric sculptures were indelible features of our American landscape," he said. He created neon art so breathtaking, the New York Times praised him as a major talent in its 2008 obit when Stern died at age 69. The paper hailed him for reviving the "lost art" of neon. Indeed, Stern's gallery had wonders like a neon cello with neon notes fluttering around it timed to music. And he created a neon landscape for performance artist Laurie Anderson's Broadway show in 2000. But he always reminded reporters that he paid his utility bills and rent with neon signs that said "Pizza," "Beer" and "Fat Joe's," which he considered a form of urban art, a kind of electric graffiti. In Chattanooga, Coker Tire founder Corky Coker rescued many vintage neon signs from all over America and had them restored by Ortwein. Teal says two of the signs were discovered on the "American Pickers" TV show. "Corky had us refurbish a 'Ford Tractor' sign, one for 'Big Hearted Smitty's' (car dealership) and a big Hudson dealership neon sign," Teal says. All the sign sparkle inside Coker's Chestnut Street museum, where visitors can not only see the signs, but marvel over his collection of rare cars. Contact Lynda Edwards at ledwards@timesfreepress.com or 423-757-6391.